"A great cover image makes a promise to the reader. Readership has been low for this book, so I took a step back for a moment of quiet review. Is something wrong with the cover? Yes, it's blocky, dark, static, and there's nothing eye-catching. I'm an indie author in exploratory mode, learning as I go, and since I enjoy creating my own covers for the time being, I'm gonna stick with it. I'm not ready to give up on my image just yet, so I aimed at quicker fixes like color and font. 1.) 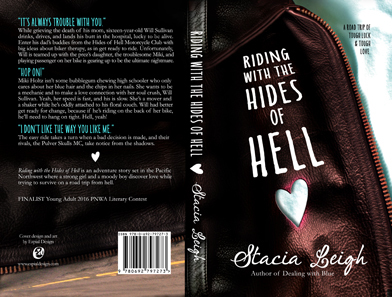 I over-layed the dark part of the cover--the black leather and the asphalt road--with an autumn brown. Instead of feeling cold, it took on a warm tone. The brass zipper stands out a bit more, which helps identify it more as clothing. 2.) I changed the font to match Dealing with Blue since Will Sullivan is in both books. 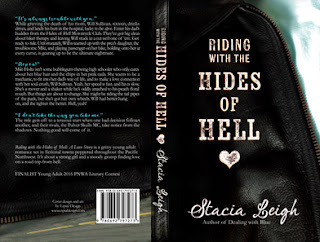 A sidekick in the first and now the main character in Riding with the Hides of Hell. Plus the font looks young and fun. 3.) I tilted the title to create a feeling of action and speed. It's an adventure romance; the kids are going places on their motorcycles. They're feeling a bit off-kilter with the danger surrounding them and with their growing love. 4.) I swapped the gritty, squat-looking heart with one that is clean, but not perfectly shaped. It's sort of stretched like it's about to turn into action lines, riding into the distance. It also matches the new font, young, energetic, and fun. What do you think? I'm open to hearing how I can improve. Does the font work? Should I look for a different cover image? Does it say, "teen romance and road trip adventure" to you? Let me know in the comments! Thank you.